A Heron drone in El Salvador, in May 2009. Today, Israel is considered a leading player in the field of unmanned aerial vehicles. The French Defense Ministry decided last week to purchase unmanned aerial vehicles from Israel, thereby bringing an end to a 42-year-old embargo on weapon purchases imposed by President Charles de Gaulle. The approved sale of Heron TP, or Eitan, will be the first time the drone is sold to a foreign country. The Eitan is the largest and most sophisticated drone made in Israel. It is assembled by Israel Aerospace Industries, and went into operational service in the Israeli Air Force a year and a half ago. The Eitan has a wingspan of 26 meters – similar to that of a Boeing 737. It is capable of carrying out reconnaissance and intelligence missions in an altitude of up to 40,000 feet, and can remain airborne 36 hours. Eitan's large size allows it to carry a variety of equipment such as radars, sensors and camera, and, theoretically, missiles. The French embargo had two immediate results: the first being that Israel began purchasing American fighter jets, first the Skyhawk, then the F-15 and F-16 and now the F-35, billed as the Israeli Air Forces next fighter aircraft. The second result was the acceleration of the domestic fighter jet industry. The first plane assembled in Israel was the Eagle, in effect an Israeli-made French Mirage, using plans and sketches smuggled out of France. The Kfir fighter was later assembled, followed by the Lavi program, which was canceled after two prototypes were built. 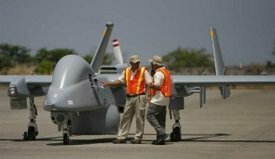 The grounding of the Lavi caused the Israel Aerospace Industry and other companies such as Elbit to shift their focus to unmanned drones. Today, Israel is considered a leading player in the field of unmanned aerial vehicles. Israel Aerospace Industries refused to comment on the deal, but a senior security industry official said on the weekend that "this is a truly and historically coming full circle. The French embargo and de Gaulle's refusal to provide us with a French jet that was developed with Israeli expertise gave the Israeli industry a push, and now it the one providing France with an Israeli plane."